This topic will explain the DriveWorks migration process, using the DriveWorks Migration Tool, and the steps you need to take to ensure a successful migration from earlier versions of DriveWorks. As DriveWorks no longer supports Excel based projects this tool is only available from the installation of DriveWorks 11 or older. Before attempting to migrate your project, you should always take a full backup of your original DriveWorks project. Please Note: DriveWorks Pro Server 11 can only be installed on the same machine as DriveWorks 10 SP3 Pro Server. Any versions prior to 10 SP3 are to be run on a separate machine. 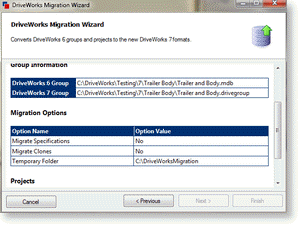 DriveWorks 7 to 11 data will open and run in DriveWorks without the need to migrate the data. 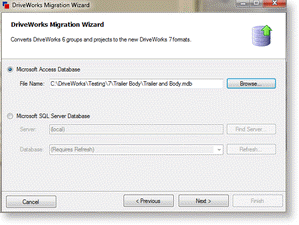 Once the DriveWorks 7 to 11 data has been opened and saved in DriveWorks it cannot be opened in the previous version. 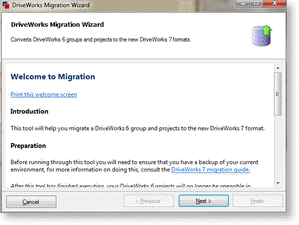 When migrating from DriveWorks 6 it is essential you currently have the last release service pack of DriveWorks 6 installed and your implementation can run on this version. The last service pack released for this version was SP 8. To find out the version you have installed please see the article How To: Determine the Version of DriveWorks. Before you begin, there are a few things you need to know about the migration process. The most important thing to remember is that migration does not create a new migrated copy of your data, it modifies the copy that you give to it. What this means is that if you need to run DriveWorks 6 and later versions of DriveWorks side-by-side, you must first use DriveWorks 6 to make a complete copy of your implementation, and make sure that it works. For help doing this, take a look at the How To: Copy a DriveWorks 6 Implementation guide. Another important point is that the implementation you migrate should be a full working version, if any of the project files are missing or unavailable, the migration process will fail and attempt to rollback any changes. Finally, during the migration, the migration wizard works on temporary copies of your files so that if the migration fails for any reason, the implementation is left in its original state. Because of this, you must make sure that the directory you choose for the migration wizard to store temporary files in has plenty of space - depending on the size of your implementation this could be anything from a dozen megabytes to a few hundred megabytes or even more for large groups. Introduction to the migration process. Select the DriveWorks group to migrate, either by browsing for the group's Microsoft Access database, or for its Microsoft SQL Server database. Choose where to create the new DriveWorks group, by browsing for an individual group file location. Choose whether you want to migrate released model information. Review your migration options before you migrate, if there are any missing design masters or project files, an error will be shown in the list and you won't be able to proceed. The migration process will start, and when completed, the "Finish" button will be enabled. 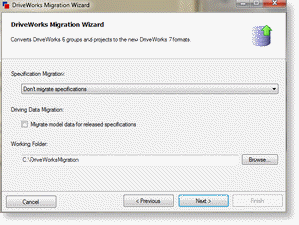 Click "Finish" to close the migration wizard. With DriveWorks 6 new drawings were always stored with the parent model. From DriveWorks 7 you now have the ability to store drawings in a separate location to the parent model. If the relative path parameter for each drawing is blank, the drawing will be stored in the Default Specification Folder location (see General Settings). If the parent model has it's relative path set to somewhere different to the Default Specification Folder, new drawings generated will be stored in a separate location to the parent model. In DriveWorks 6 control over which users could specify which projects was granted in Team Settings. From DriveWorks 7 this now administered through Security Settings in the task list. After migrating the DriveWorks 6 project, please check the project permissions tab of any Teams that have been created. Added functionality may mean some settings need updating.